Virtual I/O technologies consolidate server connectivity and allow a single server connection to act as many, in the same way a virtualized server enables one physical server to appear as multiple devices. 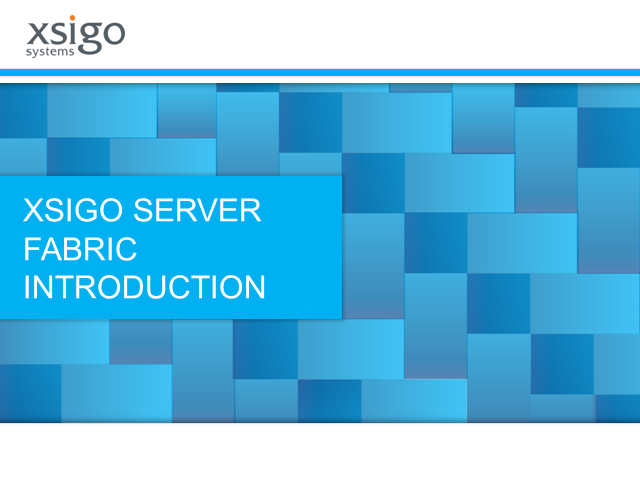 Xsigo's unique virtual I/O technology offers unprecedented levels of performance, scalability, and ease of use, allowing data center managers to connect any server to any network and any storage resource in minutes rather than days or weeks. Join this webcast to learn about new technologies that connect virtual machines to networks and storage more flexibly and with higher bandwidth than ever before. Eliminate the pain of legacy network management and get 4X more performance. Attend this webcast for the inside scoop and learn about exciting new solutions from Xsigo. 5 Ways Virtual I/O Cuts Costs... with Use Cases to Prove It! Virtual I/O converges network and storage, but how exactly does it cut costs? The answers provide an important look at how the next-generation data center is dramatically more efficient. This webcast will get into the specifics, and look at the dollars and cents of actual virtual I/O use cases. The cloud is really two intertwined ideas: the private cloud and the public cloud. In this webcast we will look at the two concepts and how they complement each other. We will also look at your alternatives to build a private cloud. Some vendors suggest this is best achieved with a packaged solution. This implies equipment swap-out and significant new investments. But you do have other options. In this webcast we will look at what it means to build a private cloud and how you can get there with the equipment and vendors of your choice, and by re-using much of the gear you already have in place. Join this webcast to learn how virtual I/O can reduce Oracle costs and increase efficiency. Oracle applications demand a lot from server I/O. Storage, networking and cluster communication requirements drive up cost and complexity, and can introduce bottlenecks that sap application performance. In this webcast, we will discuss Oracle I/O requirements and the opportunities to deliver more Oracle capability for less cost with virtual I/O. Xsigo virtual I/O is built on an InfiniBand fabric, the same interconnect used by Oracle in their highest-end systems. Xsigo delivers that capability in a cost-effective solution that lets you consolidate I/O across all requirements to a single infrastructure, while delivering the performance you need to eliminate bottlenecks. Attend this webcast and find out how Xsigo virtual I/O today helps IT shops around the world get more from their Oracle deployments. VDI places significant demands on servers and data center infrastructure. While users expect the performance of a local machine, you face some tough deployment obstacles: budget, space, time and the inherent limits of networks. Join this webcast and get success tips learned from other data center managers. Xsigo has helped optimize the data center infrastructure in VDI deployments both large and small. We will share the lessons from these deployments. And how virtual I/O helps to deliver proven performance that users notice while consolidating resources to save cost. Join this webcast to learn what virtual I/O is and what problems it solves. Traditional I/O limits flexibility, and may keep you from getting the most from your virtualized servers. In this webcast, we will look at the data center infrastructure challenges in VMware, Citrix, and Hyper-V environments, and in bare-metal environments as well. And we will discuss the results achieved with virtual I/O in real-life deployments. Virtual I/O streamlines data center operations by providing a faster, more flexible way to connect servers to networks and storage. With virtual I/O, connectivity becomes software controlled, so infrastructure can be managed in real-time, from anywhere. And it consolidates the physical infrastructure to reduce capital costs, space requirements, and power & cooling demands. Join this webcast to learn more about virtual I/O and how IT managers at companies such as Accenture, salesforce.com, VMware, Qwest, and McAfee use it today to save time and money.